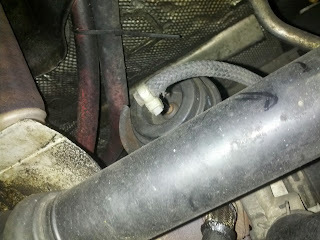 I got underneath the car and pulled the vacuum hose off the VNT (turbo) actuator. I hooked up a hand vacuum pump with a gauge on it and put some vacuum on it. The vacuum wouldn't really hold very long, either because the vacuum pump hose or the actuator leaked, but that wasn't really here nor there - I did manage to get well over 10 inches of vacuum plenty of times and the actuator didn't even think of moving. I tried to move the assembly with my hand and the thing was frozen stiff. So I've pretty much come to the conclusion that either the actuator is frozen, the vanes or frozen, or/and the actuator is screwed. Furthermore, I think the easiest way to deal with it is to try to get the turbo off. Then I can fix it whatever way I need to, or even replace the turbo if need be (and if I can find another one I can afford).